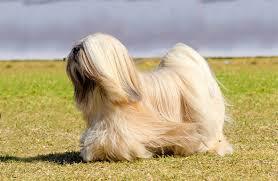 This is one of the oldest reg=cognized breeds in the world, bred approximately as long ago as 800BC and hails from the Himalayan platau in the area of Tibert he Lhasa Apso originated on the Himalayan plateau in the area of Tibet. Their main function was to alert the Monks in the Buddist monasteries of intruders. Recent research has shown that this is one of the breeds most closely related to the ancesteral wolf. Lhasa is the capital city of Tibet, and apso is a word in the Tibetan language meaning "bearded", so, Lhasa Apso simply means "long-haired Lhasa dog", which is how this breed got its name. 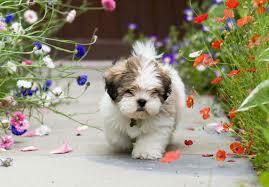 As they were bred as watchdogs, they can very wary of strangers and very loyal to their owners. If insufficient early socialization, this breed can be aggressive, so crucial to take them to puppy training and then continue the socialization. They love nothing more than cuddling up on the lap of their favourite person. If you are a very social person, with people coming and going in your home, then this breed is not for you, as mentioned above, they hail from being watchdogs and can be wary and even aggressive towards people if extensive socialization is not done. Being a watchdog, this breed tends to be independent and happy doing its own thing, but due to the watchdog tendencies and wariness to strangers, it is crucial that training is undergone. It is bright and not hard to train, but can have a mind of its own on occasion! One of the problems to be found in training, is that this is one of the breeds that matures slowly, so puppy tendencies can be exhibited up to about 3 years of age, which can make training a bit of a mission. The key to training with this dog is positive reinforcement methods and consistency. They do not require extensive exercise, but a daily walk with mental stimulation when left at home, will help to create a well balanced dog. This depends very much on the temperament of the individual dog, however you must make sure that your dog has been well socialized so that it will accept another dog into the home. As above, it really does depend on the dogs individual temperament. However, early and continues socialization will help. Overall they health is good. They do have some common problems that they are known for, such as sebaceous adenitis which is a hereditary skin disease. Another disease they are prone to is PRA (Progressive retinal atrophy). They are also prone to Cherry eye and dry eye syndrome.